Just in time for New Year’s Eve! 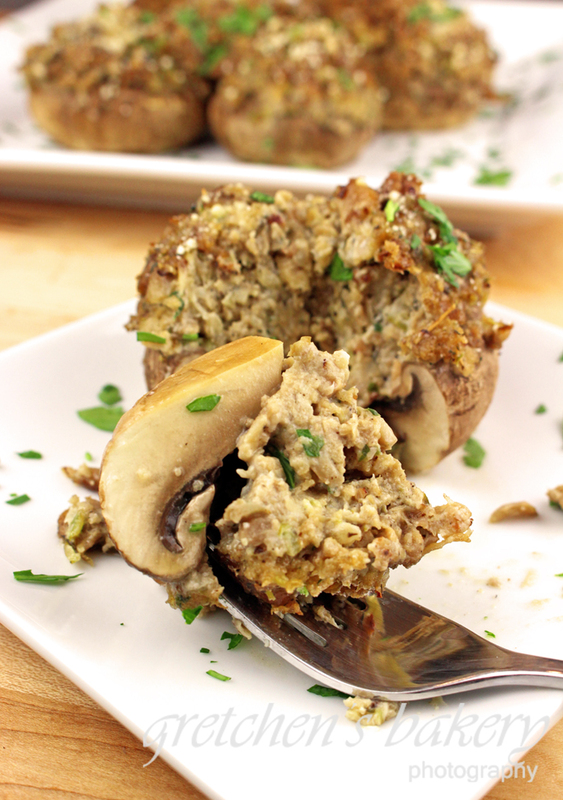 This recipe for vegan sausage stuffed mushrooms will have even your most carnivorous friends begging you to make them again and again! Perfect as an appetizer for any party, but I do love to serve these specifically on New Year’s Eve. Maybe it’s my little way of coaxing those folks who are on the fence about trying a plant based diet as many people do consider it more around new years resolution time, after all plant based eating is a healthier diet choice, so why not! And believe me, once they try these little mushrooms packed with more flavor than they have ever experienced on a meat diet (yes it’s true!) they will be ALL IN! Ok so mine are not so “little” but I could not pass up those giant mushrooms at the grocery store this week! Some of them were as big as my hand! But whatever size you get or want will work! You can make them giant as a single serving appetizer or even the main course; or just grab a couple dozen smaller ones for bite sized finger food for your next gathering. This recipe has been with me for more than 20 years and before I transitioned to vegan, I made them at every party I ever had! So you can imagine how thrilled I am to show you how to easily veganize this recipe without compromising a stitch of flavor and the texture is right on! You can use any brand vegan sausage you like, just be sure to read the ingredients as many brands claim to be “meatless” but will then add egg whites or even milk. In the video I used white mushrooms since those were the giant ones that were just calling my name, but normally I buy baby Bellas since I find them to be more flavorful and just better (in my opinion). If portabellas are more your style, go for it! Any mushrooms that are stuff-able will work great! I also used panko whole wheat bread crumbs, but again, any bread crumbs will do fine. I’ve also used gluten free bread crumbs with great success. In a pinch I’ve even used a piece of toast crumbled up when I ran out of bread crumbs in the pantry! That’s the thing about cooking versus baking, it is just way more forgiving! Speaking of baking I would definitely be serving these with an equally finger food-able dessert like my Chocolate Chip Cookie Dough stuffed Brownies or Whiskey Truffles! Previous Post: « 6 Classic Cake Recipes Veganized! Have you ever made the filling the day before?